From our research work in 2015 and 2016, we noticed that a lot of government documents are often removed or no longer available sometimes within weeks of accessing them. In digital age, government documents that are unavailable as soft copies that can be found on the Internet might as well be inaccessible to the public. As an example, recently the Ministry of Finance website was revamped. 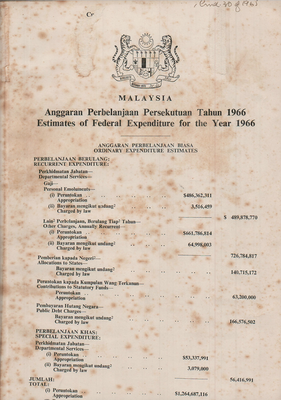 Hundreds of downloadable documents of past annual budgets suddenly became inaccessible. This public platform, is a website where various researchers can upload and share government documents that they downloaded, but are now no longer available online. We're testing with our own large archive of documents first with 2015 and 2016 budgets and Auditor General Reports. If you have a large amount of government documents used in your research which may no longer be available on-line, do get in touch with us on how we can add it to this archive for benefit of others.